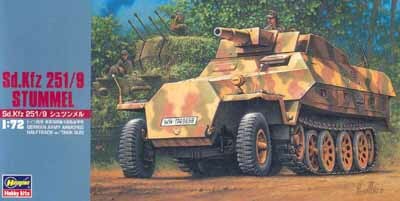 This particular review article covers modeling the Sd.Kfz.251/9 support halftrack in 1/72 scale. 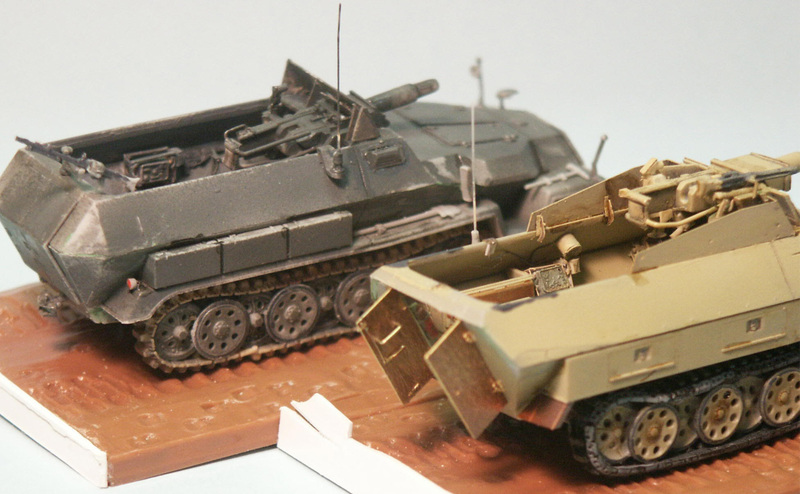 My goal in this article is the comparison of the Hasegawa versus the Dragon Sd.Kfz. 251 models and the study and assembly of the Sd.Kfz 251/9 vehicle in 1/72 scale. 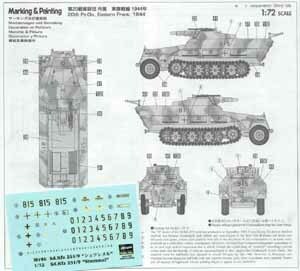 Model kits I chose were the Hasegawa model MT-46 late-version Sd.Kfz. 251/9 kit assembled with the help of etched brass frets from Part; and a conversion of the Dragon kit #7223 Sd.Kfz. 251/1 Ausf C, to an early version 251/9. My intentions for years have been to use ESCI’s old 251 Ausf. C kit as the basis for a 251/9 conversion; however the Dragon [DML] kit is so much superior over ESCI's that it gives us the capability of a much better model with less effort. There will already be considerable effort converting it from a 251/1 to a 251/9. Dragon’s Ausf. C and Ausf. D kits share many of the same parts so this review will also reflect Dragon’s Ausf. D kit. 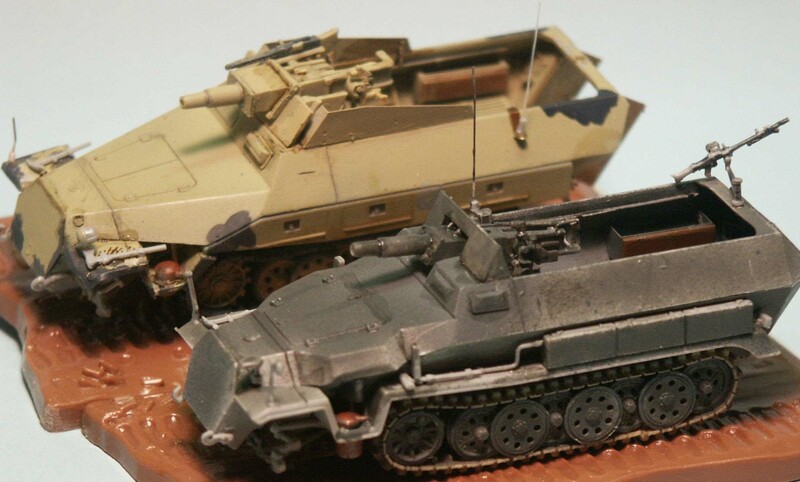 Around the year 2000 Hasegawa released their model of the Sd.Kfz 251/9 Ausf. D halftrack model which I greeted with great thrill. Not only was the Hasegawa kit a great improvement in quality & detail over the earlier ESCI Sd.Kfz. 251 halftrack, but it was also a model of the later model D [Ausf. D]. 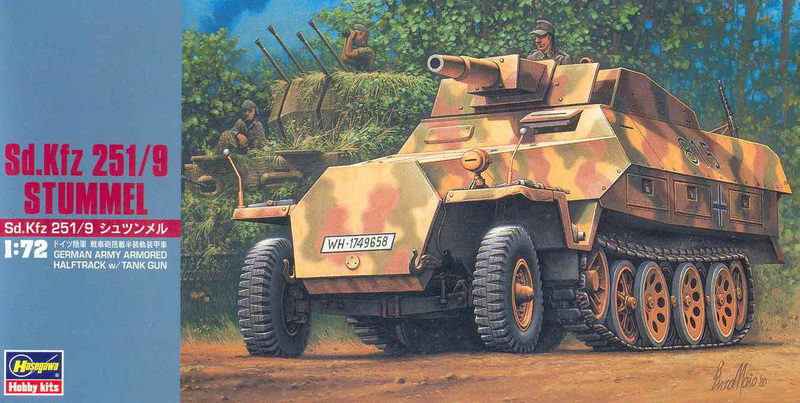 The Hasegawa vehicle was also offered in versions not offered by ESCI [now Italeri]: the Sd.Kfz. 251/9 Stummel and the Sd.Kfz. 251/22 Pakwagen. Make note that the nicknames ‘Stummel’ and also ‘Pakwagen’ were not official vehicle titles, though I will use the term Stummel here as this is the vehicle’s commonly used nickname. Mounting a short 75-mm cannon (Kanone), the Stummel provided valuable support for the German Panzergrenadiers. There were two basic versions; the first based on the Sd.Kfz. 251 Ausf. C (and early Ausf. D) which had the Sturmgeschütz’s 7.5-cm Kanone 37 L/24 gun mounted low in the superstructure on a pedestal supported on the halftrack’s frame, with the gun protruding through the front driver’s plate. [This is the version that is the subject of the Dragon conversion.] This version saw combat after April 1943 though test vehicles were available as early as June 1942. The later version of the 251/9 and the subject of the Hasegawa model MT-46 was developed with the purpose-built 7.5-cm Kanone 51 that was installed atop the roof over the driver and was a more simple conversion of the 251 Ausf. D. For more detailed information on these vehicles I refer you to the references listed below. This is the same mount as in the Sd.Kfz 234/3 8-Rad armored car. Both Dragon’s and Hasegawa’s Sd.Kfz 251 have their parts and sprues covered in other articles, so I will try and focus on features particular to the 251/9, shown and discussed below. 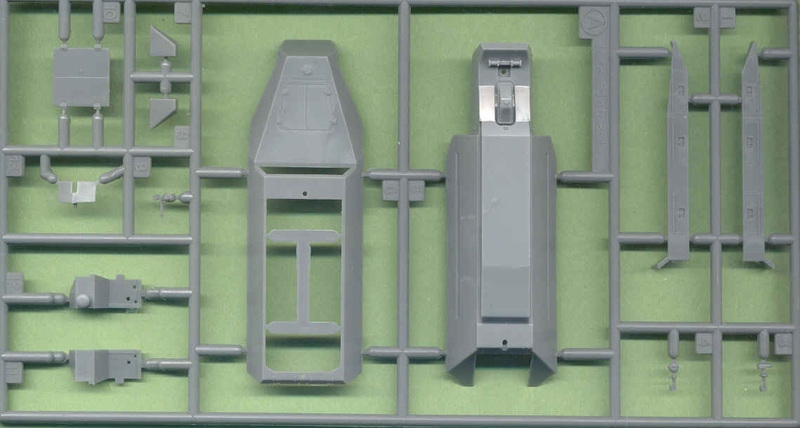 Here we have the Hasegawa sprue for the upper and lower body of the Sd.Kfz 251 Ausf. D, common to all three of Hasegawa’s 251 kits. The side storage bins at upper right (parts A1 & A2) can be replaced by Part’s etched brass parts and therefore modeled open. The rear doors (part A10) are modeled closed but can be easily separated so as to be modeled open. Part’s etched brass frets for this Hasegawa’s model. The replacement front fenders were difficult to shape and fit properly but overall this set offers some excellent upgrades to Hasegawa’s plastic parts. 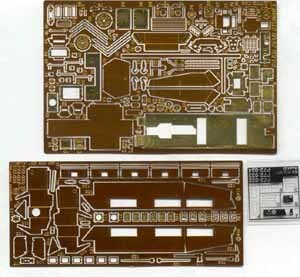 The clear sheet at lower right has a replacement instrument panel and viewport windows. 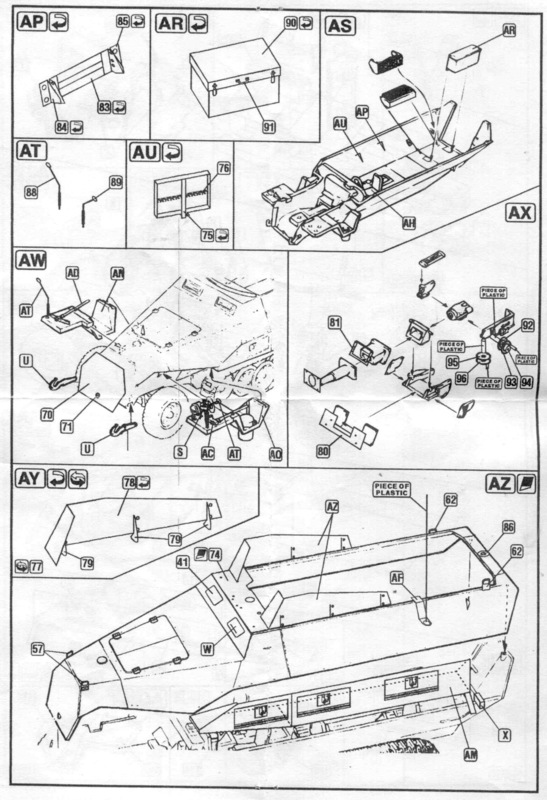 The brass fret at the top is particular to the 251/9 with brass side armor, ammunition storage box, and details for the Kanone 51 gun as shown in part AX of Part’s instructions. Hasegawa offers a new Sprue J just for this model in light gray styrene plastic that includes the basic parts for the side armor and basic 7.5-cm Kanone 51 gun. The shield parts are too thick for 1/72 scale, and the gun lacks the elevation and traverse handwheels and the gunsight. 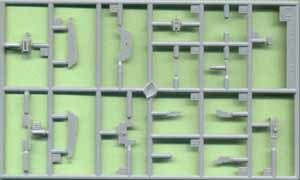 This is the same sprue in Hasegawa’s Sd.Kfz. 234/3 armored car kit. 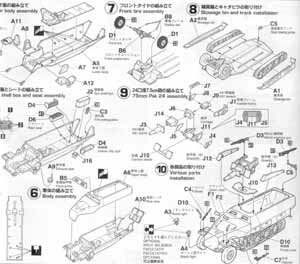 Hasegawa’s instructions for their 251/9, a variation from their basic 251/1 troop carrier instructions. Note the assembly of the main gun, mounted atop the driver’s roof. Part’s brass fret supplies some needed elevation & traverse parts but no gunsight. 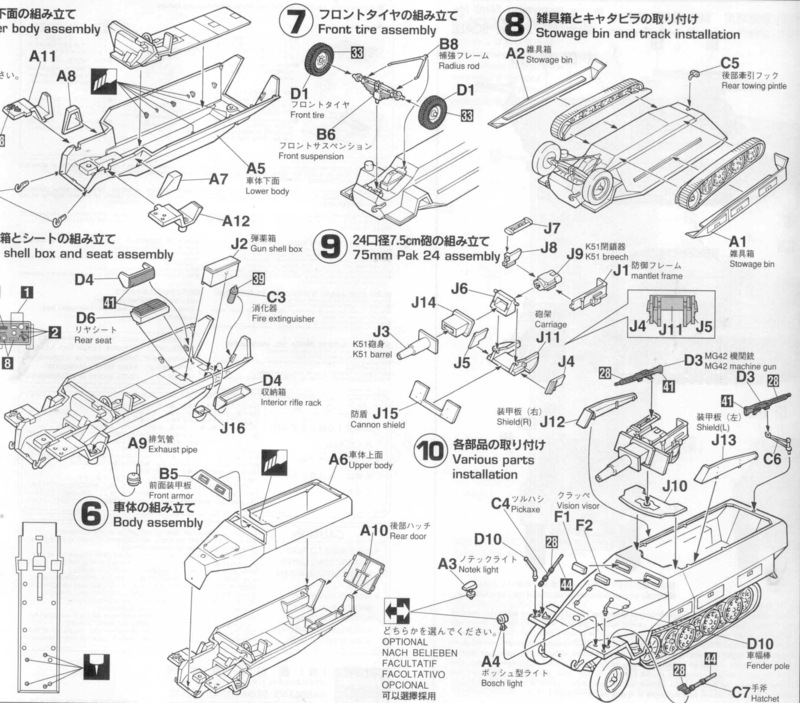 This is Hasegawa’s painting & decal guide. Though not in Dragon’s glossy full color spread, this is fully adequate for the job. The decals applied well on the finished model over a glosscoat of acrylic floor wax, then finished with Model Master’s acrylic dullcoat. It’s interesting in that Hasegawa offers a ‘build your own’ license plate system similar to that offered by Dragon. Conversion of Hasegawa’s Kanone 51 gun to the earlier 7.5-cm.Kanone 37 gun took some careful thought, studying, scratchbuilding and dry-fitting of the parts. References for the early Kanone 37 mounted in the 251 are few and far in between. 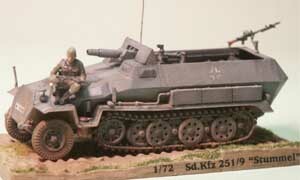 The new gun base and cradle were patterned after parts from Roden’s Sd.Kfz 234 kit and the museum photo references. Parts were cut, fit, sanded and filed and refit till they looked right. 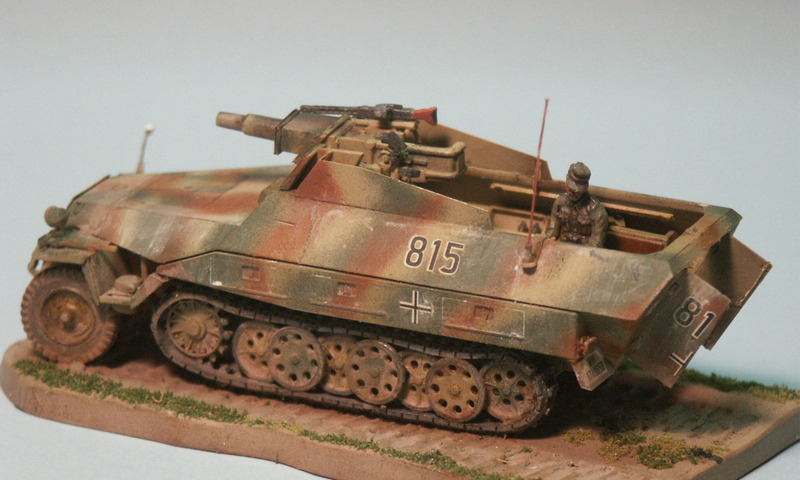 For the conversion to the early Sd.Kfz. 251/9 based on the 251 Ausf. 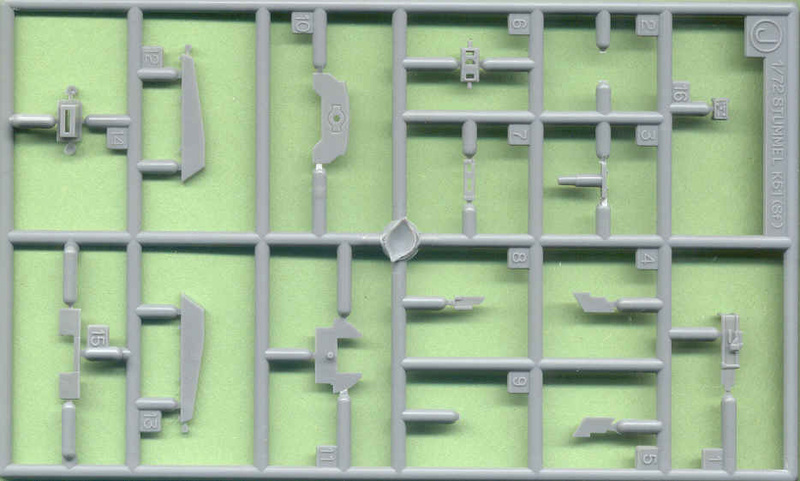 C, the Hasegawa sprue J [shown above] can be used but must be considerably modified to represent the earlier 7.5-cm Kanone 37 gun that had been mounted on the floor of the Sturmgeschütz. 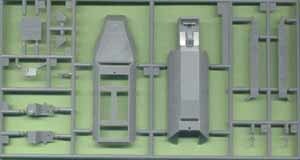 We can also use and modify the sprue from Italeri’s Sd.Kfz. 234/3 armored car model. Another option for the 251/9 Ausf. 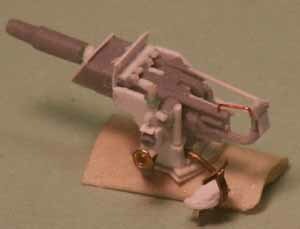 C conversion is the gun from Roden’s Sd.Kfz. 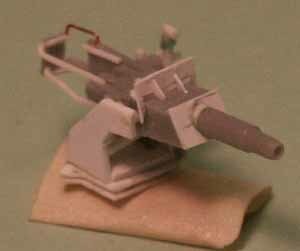 233 kit, which has the same Kanone 37 gun and mount as this 251/9 Ausf. C halftrack, though it still needs some detailing to improve. 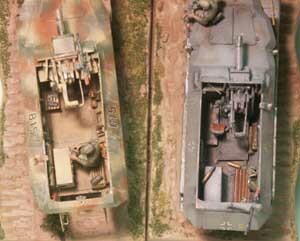 These two photos exhibit the differences between the initial version of the Sd.Kfz. 251/9 with the floor mounted weapon and the later version with the weapon mounted on the roof. The early Kanone 37 gun mounting was used with the Ausf. C hull and some Ausf. D hulls. The later version Kanone 51 was all on the Ausf. D hull. The Ausf. C interior was finished in 1942 period gray paint with a white (actually ivory) driver’s compartment forward of the flange connecting the hull sections. When I completed this Sd.Kfz. 251/9 Ausf. C, I understood that this halftrack's driver's area was painted white; it just made sense to me and matched several period photos I have. Recently, well, after completing this model, I was informed that this white driver's area was true for the 251 Ausf. A and B and some early Ausf. C halftracks; but most 251 Ausf. C had the driver's area painted the same dark gray as the rest of the exterior and interior. After further studying period photos I now also agree that this is the case! The period photos I based my colors on I know believe are of Sd.Kfz. 251 Ausf. A or B which did have an ivory driver's area. The 251 Ausf. D’s interior was completed in overall Dunkelgelb, same as on the exterior. In this view we can see the interior details such as the flanges just behind the driver’s seat, ammunition storage, and crew seating. Note the location of the radios at the left center, moved from the right front due to the location of the main gun. In the gray colored 251/9 Ausf. C at far right you may be able to discern the scratchbuilt pedestal mount. 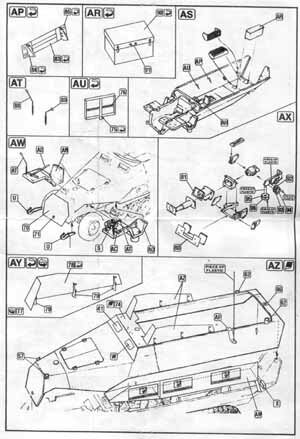 The photos above of the Ausf. C with the Kanone 37 gun version can be compared with the late 251/9 Ausf. D in the photos below. The roof mount of the Kanone 51 gun freed some space in the crew compartment and allowed the vehicle to be more easily converted, though was higher in profile. 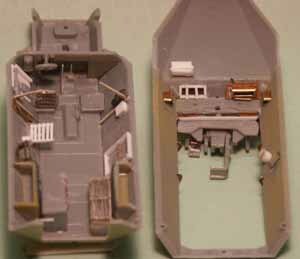 View of the right interior of the partially assembled Hasegawa 251/9 Ausf. D kit with the crew seat and ammunition ready-rack, but prior to detailing of the 7.5-cm Kanone 51 gun. 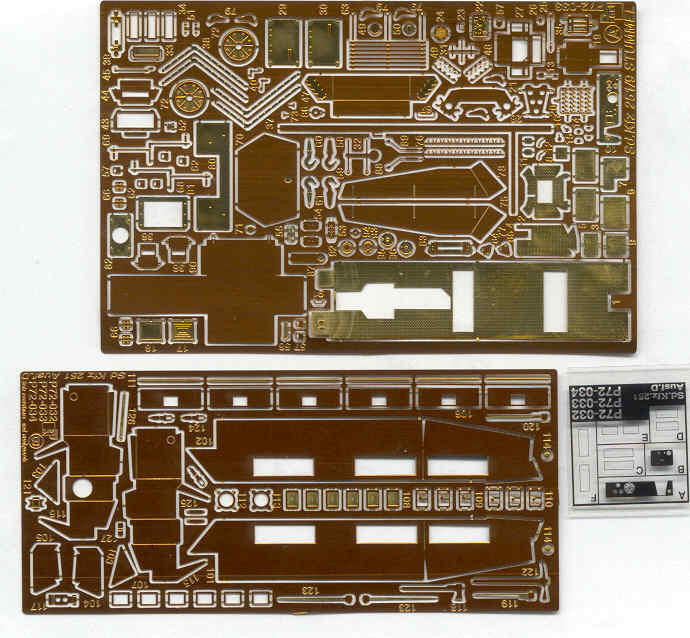 This Hasegawa kit shows the Part aftermarket brass and the right side’s scratchbuilt ammunition ready-rack [the Part brass part #75 is too large]. 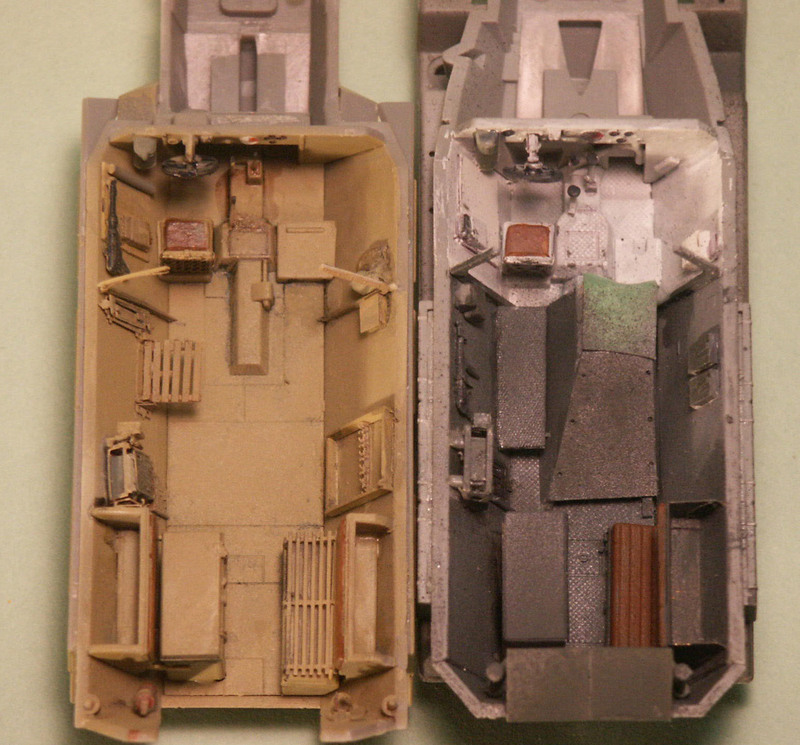 This photo shows the left interior of the Hasegawa model with considerable detailing thanks to Part etched brass and spare DML parts and sheet styrene. Items like the ammunition bin latches were made from thin wire. The entire interior was later painted in Panzer yellow, the same base color as the exterior. The two mostly completed Sd.Kfz. 251/9 models in 1/72 scale, still waiting on final painting, front wheels, decal markings final weathering. Both compare well in width and length. This is a good opportunity to examine the differences between the early 251/9 on the Ausf. C body [in gray color] and the late 251/9 on the Ausf. D body [in panzer yellow]. The early gun of the Ausf. C version sits lower, protruding through the front next to the driver’s visor. The bases are from old Matchbox 1/76-scale AFV models with diorama bases. The rear ¾ view of the two almost-complete models. From here we can see the changes between the Ausf. C at left, and the Ausf. D at right; such as the change in the rear doors and the storage bins. 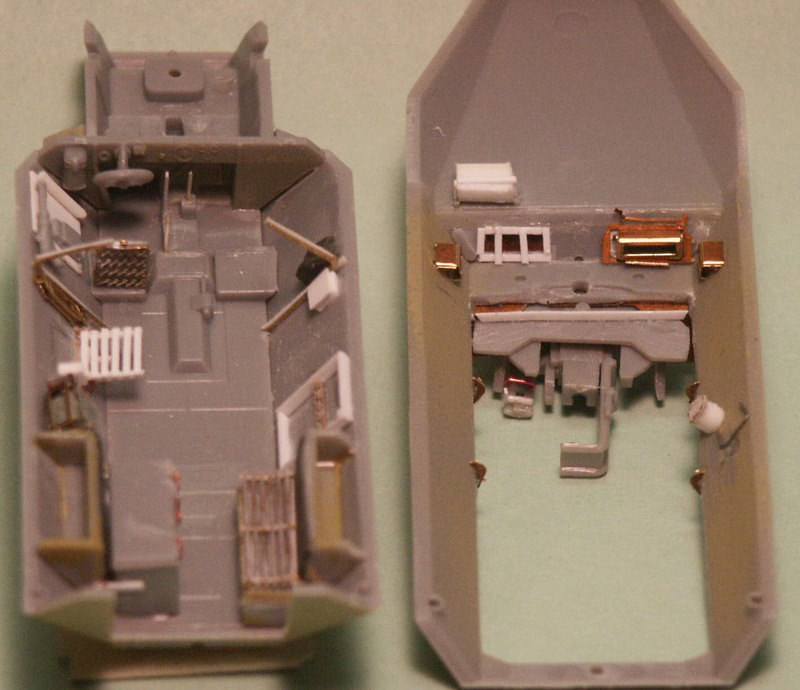 The Hasegawa model at right has been upgraded with etched brass, open rear doors. Ta Daaaaa…! 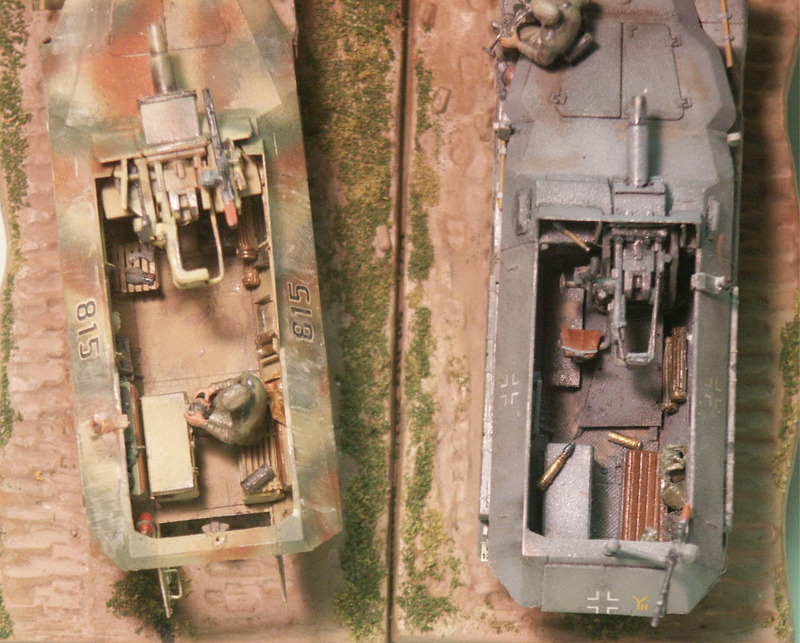 Overhead view of the two models. I am pleased to have received a gold medal for the early Sd.Kfz. 251/9 Ausf. C (at right) at the AMPS East Contest this past autumn 2008. Ammunition rounds and storage tubes are from Attack Models resin Ammunition Set No. 2 (Item #72322). The markings are water-slide decals included in the model kits, except for the license numbers on both models. Dragon’s and Hasegawa’s license plates comprise a white rectangle and separate individual numbers and letters; this effort takes the patience of a saint to put together and get the numbers all straight and so were not used (I am not a saint no matter what my family thinks). The markings were applied over an acrylic gloss coat and then sealed in Model Master dullcoat. Hasegawa’s model represents a vehicle of the 8th Company of the 2nd Battalion, Panzergrenadier Regiment 59 of the 20th Panzer Division on the Ostfront, in a 3-color camouflage scheme. The Dragon model represents an early Sd.Kfz. 251/9 Ausf. C of the 9th Panzer Division of Heeresgruppe Mitte (Army Group Center), Ostfront. After the base paint color an oil pin-wash was used in recesses and only then a light clear dullcoat applied. Weathering was completed with a light dusting of thinned earth color acrylic paint on lower areas, then with powdered pastels and pigment powder. A Graphite pencil was used to represent wear of the paint on edges and corners. Dragon Sd.Kfz. 251/9 Ausf. C Conversion, a Sd.Kfz. 251/9 Ausf C of the 9th Panzer Division of Heeresgruppe Mitte (Army Group Center), Ostfront. Both kits build into a decent display model especially with some etched brass details. Reflecting newer molding technology the newer Dragon model comes with more and more finally detailed parts. 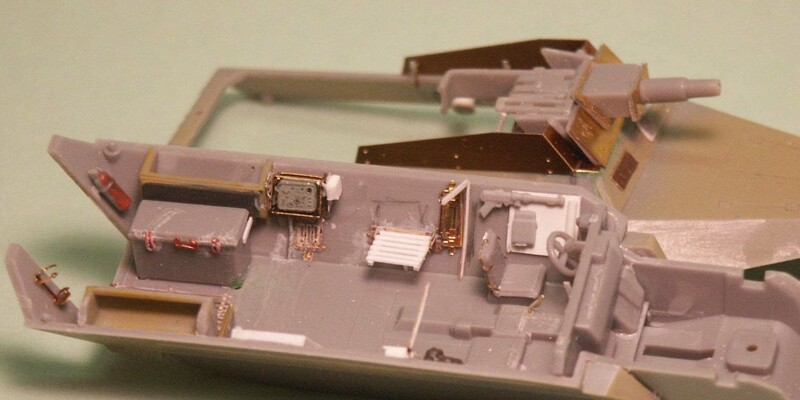 Hasegawa’s tracks strike me as too thick and nothing detracts from an AFV model like poor tracks. If I were a wargamer I would go with the Hasegawa or ESCI kits; for a display model I recommend the Dragon model. A vehicle of the 8th Company of the 2nd Battalion, Panzergrenadier Regiment 59 of the 20th Panzer Division on the Ostfront, in a 3-color camouflage scheme. PANZER TRACTS No 15-3 mittlerer Schuetzenpanzerwagen Ausf. C & D, By Thomas Jentz & Hilary Doyle. A superb softcover on the production, variants, organization and employment history of the Sd.Kfz. 251 from 1943 to 1945. With scale drawings and sharp black & white photos. The Panzer Tracts books are probably the most accurate English language source for information on German WW2 vehicles. Highly recommended for the modeler and historian. PANZER TRACTS No 15-2 mittlerer Schuetzenpanzerwagen Ausf. A to C, 1939 to 1942 , by Thomas Jentz & Hilary Doyle. This is a companion book to Panzer Tracts No. 15-3, and both books expand on and have replaced Panzer Tracts No. 15. Sd.Kfz 251 In Action, Squadron/Signal Armor No. 21, by Charles Kliment & Don Greer (1981). An old book with some old disproved information, but inexpensive and containing great photos, color plates and sketches. Very recommended. SCHUTZENPANZERWAGEN War Horse of the Panzer Grenadiers, by Horst Scheibert (1992), Schiffer Military History. An inexpensive softcover with period photos and coverage of the Sd.Kfz 251 and its smaller cousin the Sd.Kfz. 250. NUTS & BOLTS Vol. 06, KANONENWAGEN (Sd.Kfz 251/9), by Detlev Terlisten. This is a good reference I used and it focuses on the Stummel but I understand now that it has been replaced by the even better NUTS & BOLTS No. 21. This book will also be helpful is detailing the Sd.Kfz. 234/3 armored car and Sd.Kfz 250/8 light halftrack.